Obligatory appointments during peak hours. In DCT the peak hours are movable. DCT will inform beforehand about the time range in which the drivers will have to appoint their visits. If a driver arrives during those peak hours without the appointment in e.Brama system*, he will not be able to pick up or drop off the container. *In some cases the drivers who arrive without the appointment will be transferred to the buffer parking lot inside the terminal, where they will be waiting for their turn. DCT ensures priority service to the drivers who appointed their visits in e.Brama system. From this moment on e.Brama vehicle booking system is the only way to pick up or drop off a full container in DCT Gdansk. 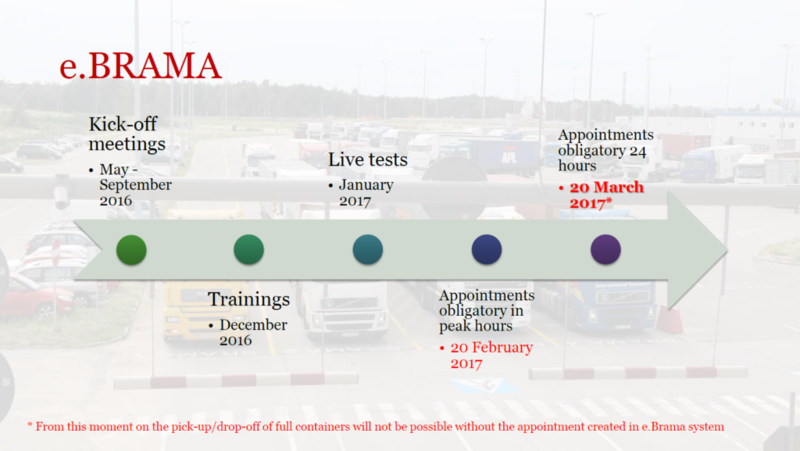 The appointment visits will be mandatory 24 hours for every truck driver arriving at DCT Gdansk.